Hilarious and fitting that the Elise on top is sponsored by a Chiropractor. I'd like a good cracking after every drive. TPup: That backyard buddy looks really nice. I don't see that it's bolted into the concrete floor of the garage? Does it need to be? DPM: Looks like the Eagle lift is bolted in. Is this just owner preference? Someone mentioned something in this thread about an air compressor. Do these lifts require one? Do they come with one? Backyard Buddy lift doesn't need to be bolted down. I even have the optional casters which allow the lift to be rolled around if needed. I'm looking to get one of those lift and there have so many choice at different price that I dont know which one should I get ??? Finally , even closer to me , in Quebec city (1h30 from me) there have a company called Parkolift and they are asking close to 4000$ for the lift..I would like to purchase from them too because they are local but why should I pay double of the price ? What could be the best explanation ? Anybody could help me with that . Yeah thats what you are seeing. The lift drops down right where that chevy is and that I bar comes off and you can hook up harnesses for the Sea Doos to get them up there too. And yes it is lifted up into a little atic or however its spelled. When we tested it we but a 1 ton peice of led on and the whole beam and ceiling bent like licorice (spelling lol) but thats what its supposed to do other wise its like a potatoe chip and snaps. Sorry about the spelling im half awake. So here is the result, I got mine from carlift.ca. It is made in china like most of them. The motor is a 3 hp certified... I like it so far and it was the cheapest price I found.... Very practical. Now I can even wash the bottom of my car! So here is the result, I got mine from carlift.ca. It is made in china like most of them. Don't lick it. If it's made in China it probably contains lead. hahaha Can I lick the Lotus ? It is made in England right ? Very nice! 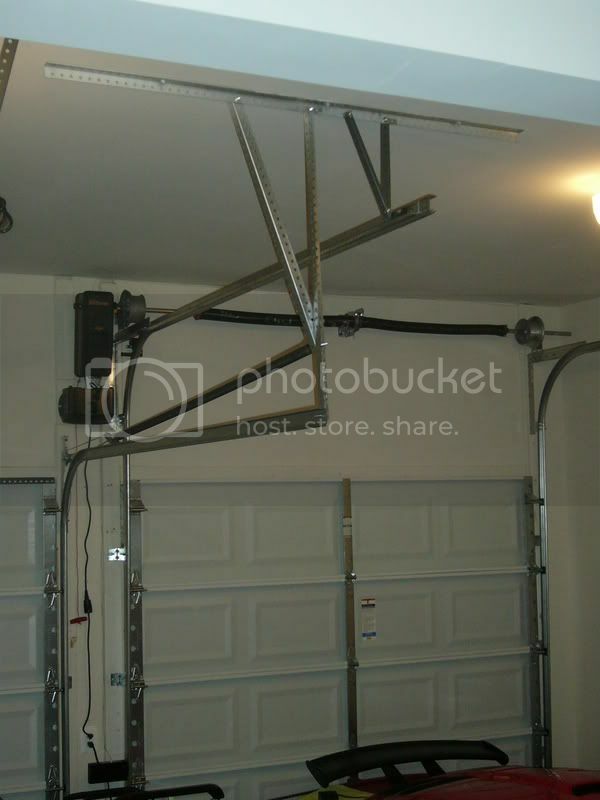 I've been following this thread closely as I think I may be adding lifts to my garage next summer. How was the setup? Is this something that can be done over a weekend with a few friends and a case of beer, or would it be better to have someone install it? Off-topic, but is the green can an MR2? I've had several; fun cars, and I've noticed quite a few former MR2 owners on the board here. Here is another lift company that I didn't see mentioned here. I have no direct knowledge of their products. Seem to be of reasonable quality and well priced. That's right my man, it is an MR2.. We got 2 of these in the family. A 92 Yellow Turbo and a 91 Green N/A.. Both have the F355 style body Kit. For the lift, I would say that it is a 5 hours job, and you need to be 4 people two times during the installation, otherwise 2 people is fine. And beer is welcome and appreciate too! I was quoted a price today of $5000 for the lift ... delivered & installed. This includes 3 drip pan inserts, 220V power, and 2 extended ramps for low cars. Gonna have to look into this for my next home!! Just had my garage door rails raised so that the door opens much closer to the ceiling. No hanging door opener on that side either. I went with the wall mount LiftMaster. The dream is slowly becoming reality. Less than $1895 and I have put it together myself twice (had to move across country). Works great and is very heavy duty. When I bought mine it came with drip pans/oil catch pan etc. Works great for getting the car up off the tires while on the lift. I am in the process of adding a 3 car garage and plan on installing a lift. This looks terrific. Beauty: 2006 Elise - storm titanium, bwr sc, sport, track, lsd, black forged wheels, arqray twin, brakeline upgrade, hardtop. Wish I had your problem... Got 3 cars but no garage I have a friend that has a lift, but, I am not sure the brand. I will try and get the make, and model next time I talk to him. But yes I can suggest you to look out for some options available on net. I was told that Garage Parking Lift are performance is quite good. I have a 9ft ceiling would a lift work? I have read you need the sum of the height of both cars plus seven inches of clearance at a minimum. More information here.